Paling fencing & gates are most commonly constructed from either treated softwood or hardwood. Treated fences are more durable than hardwood fences - with a predicted lifespan of over 25 years!, see our treated timber information sheet for more details. Hardwood fences however are much stronger, usually a bit more expensive and can last up to 20 years. Most commonly, Radiata or cypress pine is used for treated fencing & gates. Pine is a softwood with a wide grain, and is suited to pressure treatment. It is the preservative that allows a softwood to become durable in outdoor and exposed locations. The timbers are pressure impregnated with a light organic solvent preservative (LOSP). LOSP gives the timber a green appearance that stays with the life of the fence. Treated pine fences & gates can be painted, stained or left raw. There are 2 main protection levels. Timber for above ground use (palings and rails) are graded as H3. Timber for below ground (such as fence posts) are given a higher degree of treatment and are graded as H4. Paling fencing & gates over 1.5m high are installed using three horizontal rails to prevent the palings from warping or bending. We recommend the use of 50mm square galvanised steel posts when installing paling fences as timber posts tend to bend or twist in a very short time. Steel posts are set 600mm into the ground (or core drilled directly into rock or concrete), with a concrete base for strength and stability. Timber posts can be made from 170mm x 50mm timber pre mortised to accept the fence rails, or teamed with decorative 90mm x 90mm timber posts. Palings fencing & gates are available in 3 standard heights, 1.5m, 1.8m and 2.1m. For higher fences timber can be ordered from a lumberyard and cut to any size required. Palings can be fixed in several different patterns such as, 'one up one down' 'drop loop' 'straight top', 'clipped top' and more. Paling fences are the most economical of the solid timber fences available. Paling fencing comes in three basic styles and many different designs. The most common style is called 'standard paling'. With Standard paling fences, the palings are nailed side by side often leaving a very small gap of 1 to 3mm. Standard paling fences are the cheapest wood fence style. For privacy, some clients choose an overlapped paling allowing no gap between the palings for total privacy. This is commonly know as 'lapped paling fencing'. For fences that are highly visible, a wood capping to the top of the fence can give the fence a 'finished' look and is suitable where the fence surrounds your outdoor entertainment areas. This style is commonly referred to as 'lap'n'cap' fencing & gates. Hardwood fencing is strong, durable and secure! Supplied in random colours from brown to deep red which after time fades to a light grey colour. STANDARD PALING LAPPED PALING The high oil content of these timbers helps preserve without chemicals. Supplied raw, these fences can be stained or painted if desired, but are usually best left in the raw to weather with the natural landscape. Hardwood fences installed on galvanised steel posts can last over 25 years with little or no maintenance - and are strong enough to support light vegetation and small vines! 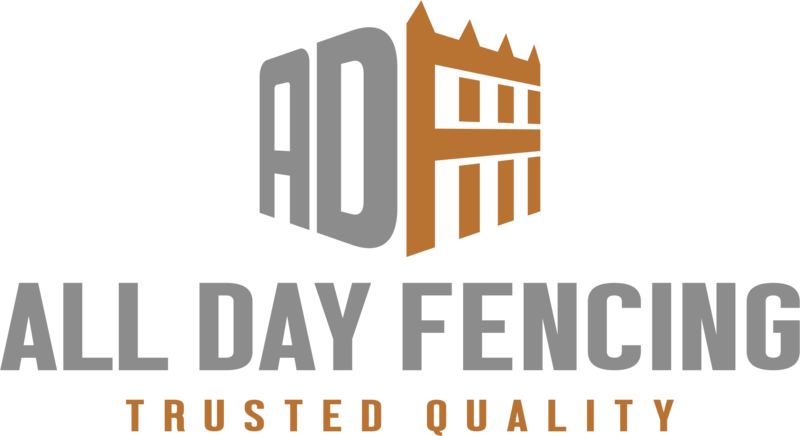 All Day Fencing manufacture a range of decorative timber gates that can be fitted to most fences. Gates can be supplied direct from the factory and delivery is available to most areas.